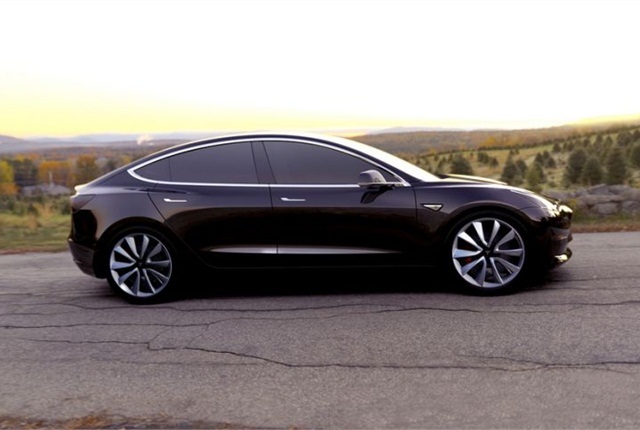 Photo of Model 3 courtesy of Tesla Motors. Tesla Motors has received more than 325,000 orders with refundable $1,000 deposits so far for its sleek Model 3 that could make the company more than a niche player with its $35,000 price tag. Tesla CEO Elon Musk has been providing updates via his Twitter account, and also confirmed he will offer the Model 3 as a rear-wheel-drive vehicle with optional dual-motor all-wheel drive. Tesla posted the latest update on April 7 to its blog. Musk unveiled the Model 3 on March 31 at a private event in Hawthorne, Calif. He said the vehicle will provide 215 miles of battery-electric driving range and include Autopilot as a standard feature. Musk hopes to produce 500,000 vehicles a year by 2020 with the more affordable Model 3 providing his higher-volume pathway to that goal. Tesla's Gigafactory, a 5.5-million-square-foot facility outside Sparks, Nev., has become operational. It should begin building lithium-ion battery packs for the Model 3 in late 2017 to coincide with the production of the vehicle. Motiv Power Systems, a provider of all-electric medium-duty fleet chassis for buses and trucks, announced a five-vehicle purchase order from Bimbo Bakeries USA. Penske Truck Leasing has opened heavy-duty electric vehicle charging stations with 14 high-speed chargers at four of its facilities in Southern California. Battery-electric vehicles are the key to zero-emission commercial transportation in North America, according to Daimler Trucks North America, which is moving forward with battery-electric vehicle commercialization, contending that hydrogen fuel cells aren’t ready for prime time. A. Duie Pyle, provider of asset and non-asset based transportation and supply chain solutions in the Northeast, announced the implementation of two new 100% electric Fuso eCanter trucks. Current sales of electric vehicles are largely driven by incentives, and while incentives help move the metal on the new-vehicle front, they have a negative effect when it comes to residual values. The West Coast Clean Transit Corridor Initiative is designed to determine how best to ensure that Interstate 5 is equipped with sufficient charging to support electric long-haul trucks.